With our SafeStorage™ service, we’ll digitally encrypt and securely store a copy of all the details on your deed poll so we can easily issue you with a replacement document at any point in the future. The replacement document we prepare would normally be either a “retroactive” deed poll or a statutory declaration. 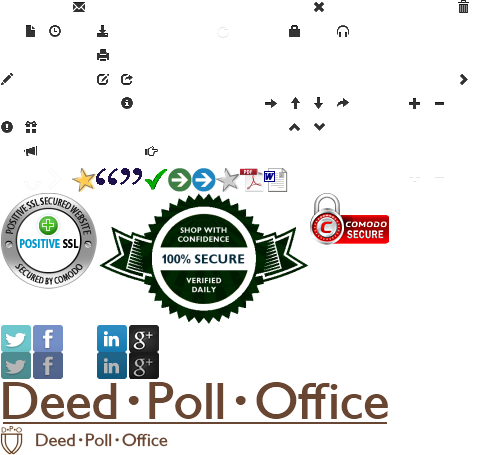 To have your deed poll archived in our SafeStorage™ service — for one person — is £ 2.00. How much would it cost to order a replacement deed poll? Ordering a replacement document from our SafeStorage™ archive costs £ 5.00. We reserve the right to update this fee based on the real costs to us of preparing a replacement document — and to increase the fee based on inflation or any other fair justification (e.g. an increase in paper, printing, or labour costs). We will not seek to make a profit from the fee, or to base it on advertising costs or any other costs which aren’t genuinely associated with the production of the replacement document (from the point that you apply for it). How can I order a replacement of my deed poll from SafeStorage™? You’d need to fill in our replacement application form. How would I order a replacement of my deed poll, if I haven’t ordered the SafeStorage™ service? You should apply for a replacement document by using our standard application procedure. Please note that the fee when applying through the standard service is £ 21. What kind of replacement document would you prepare? It depends on your circumstances and what you need the document for — but normally it’ll be either a “retroactive” deed poll, or a statutory declaration. The document, in either case, would apply retroactively to the original date when you signed your deed poll. We’ll recommend the type of document we think is most suitable for you, although we’ll always let you have the final decision. Please note that a statutory declaration would need to be witnessed by a solicitor, notary public, or Commissioner for Oaths, for which there’s a set £ 5 fee in England & Wales. In Scotland, you can get it witnessed for free by your local councillor. Wouldn’t it be better to prepare a “certified copy” of my original deed poll? No, we don’t think so. A statutory declaration is — legally speaking — a stronger document, and thus (where we think it’s a good idea to prepare this kind of document), it’s a better proof of a change of name. Both kinds of document (i.e. statutory declarations and certified copies) need to be witnessed by a solicitor, so there isn’t any kind of advantage either way in terms of complexity or cost. However, in many cases, we’ll actually prepare a retroactive deed poll — that is — when we know that it’ll suffice as proof of your (past) change of name. This is an advantage to you, because a deed poll doesn’t need to be witnessed by a solicitor. There’s one final consideration, which is that when people come to want a replacement document, they may not have changed all their records over to be in their new name. By preparing a new document (rather than a certified copy of the original document) we can more accurately reflect your own personal circumstances on the document itself, and prepare a document which is more appropriate for you and what you need the document for. What is the advantage of ordering a replacement through the SafeStorage™ service — over just making a new application — if I ever lose my deed poll? You can order replacement copies easily, without any fuss or time wasted trying to understand what you need to do or what your options are. We’ll know exactly what information to put on the document — we’ll know the correct names, and the correct date, that were originally specified. The cost of ordering a replacement through the SafeStorage™ service (£ 5.00) is much less than making a new replacement application (which would normally cost £ 21.00). How will you know what date I’ve signed my (original) deed poll on? We’ll send you an activation e-mail (or otherwise contact you) shortly after preparing your documents, to ask you for this information. We’ll encrypt your data using very high-strength encryption methods and then store it digitally on our data server. Very secure. We encrypt your data with the RSA cryptographic system, using very high-strength 4096-bit keys. The data can only be unlocked with a (securely-stored) private decryption key. This decryption key is itself also encrypted and thus can only be accessed (and used) by entering a passphrase (a type of very long password). The passphrase is known only to senior staff, and it’s not stored on our data server, nor on any other computer, nor in any digital storage medium at all — it’s only entered as and when it’s needed. Furthermore, the passphrase is changed (and the private decryption key is thus re-encrypted) on a regular basis. Therefore, it would be extremely difficult for someone to steal and access your data. Our security precautions don’t have a “single point of failure”. Even if somebody managed to hack into our data server, they’d still have to find a way to steal the encrypted data and the private decryption key, and — even then — they still wouldn’t be able to decrypt your data unless they knew the passphrase (which isn’t stored on any of our computer systems). It’s not considered possible (in the foreseeable future) to be able to break a 4096-bit decryption key (without knowing the passphrase). We'll keep your data indefinitely, or until you yourself inform us that you’d like it to be destroyed. Do you keep back-ups of the SafeStorage™ data? Yes, we keep back-ups of the encrypted data and the private decryption key. The back-ups are treated according to the same levels of security as the original data. Can I cancel the SafeStorage™ service at a later date?